First time mother Alisha is Doll Face's 2004 daughter. Today Silly Wendy (Doll Face's 2002 daughter), gave birth to a healthy and huge baby girl. If you thought Silly Wendy was big in this photo taken a month ago, you should have seen her this morning. 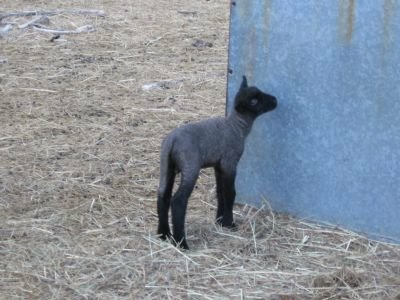 Ten-year-old Doll Face is from my very first 'crop' of lambs, and I'm thrilled to have so many of her offspring in my flock. The sheep like to sleep out under the stars in the barnyard, but if one of Doll Face's daughters (or her triplet sister, Mary) is in a bonding pen in the barn, she will stay in there, too, with her rapidly growing, sweetheart of a son curled up at her side. Oh! I want the sweetest baby! She's so tiny and cute. I can't wait until we get our sheep! That day can't come soon enough, especially because I saw the first kudzu sprouts this week. Wow! I haven't thought about this poem since I was a child. And soon he will grown into those legs! Hee hee.